There’s a lovely creature named Koko, a 1971-born female western lowland gorilla. She do like cats, and is one of the few non-humans known to keep a pet. Koko was born in San Fransisco zoo on July 4, 1971. Koko is short for the name Hanabiko in Japanese, a reference to her date of birth. She spent the first six months of her life in the nursery of the children’s zoo behind a glass window where the public could see her and where Francine “Penny” Patterson, the American animal psychologist, then a Stanford graduate student, met her. When she was 5 year old, in 1976, Francine purchased Koko and founded a non-profit organization named “The Gorilla Foundation” which dedicated to the preservation, protection and well-being of gorillas and other great apes through interspecies communication research and education. Koko is a very intelligent gorilla. When she was only 1 year old in 1972, Patterson started working with her and began teaching her American Sign Language. Being a childless woman, she also fed and cared for Koko as she would her own child, and the pair formed a mother/child emotional bond. Patterson planned to continue her scientific experiment designed to determine whether, if it were raised using sign language, a gorilla would learn to use language. Patterson has published several papers claiming that Koko has developed a vocabulary of 1000 to 2000 words and that Koko has invented words and compound words. 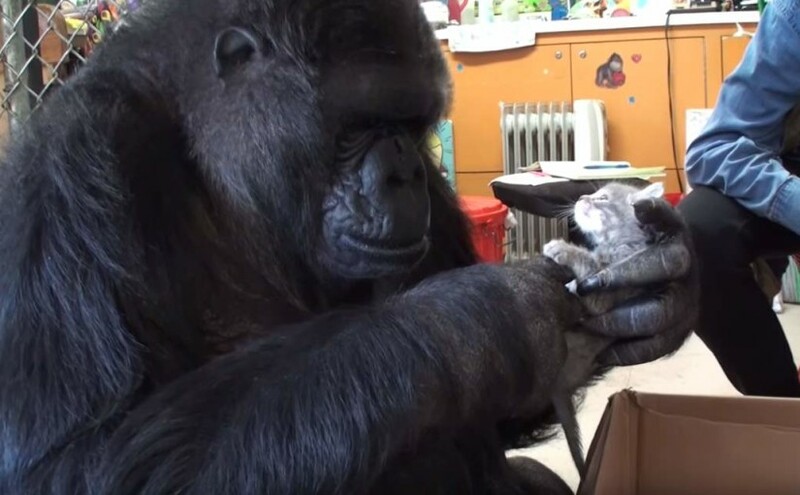 This wonderful gorilla gained publicity when she reportedly adopted a kitten and becoming one of the few non-humans known to keep a pet. On her birthday in July 1984, she was able to choose a kitten from a litter. Koko selected a gray male Manx from a litter of abandoned kittens and named him “All Ball”. In 1985, Koko was allowed to pick out two new kittens from a litter to be her companions. The animals she chose, she named “Lipstick” and “Smokey,” were also Manxes. Koko picked the name after seeing the tiny orange Manx for the first time. When her trainer asked the meaning of the name, Koko answered, Lips lipstick. Dr. Patterson was confused until she realized that Lips had a pink nose and mouth, unlike All Ball’s gray markings. Koko picked Smoky’s name because the kitten looks like a cat in one of the gorilla’s books. More Recently, to celebrate her 44th birthday on last July, Koko was presented another litter of kittens. Picking two she named them Miss Black and Miss Grey (See the first video in the page). 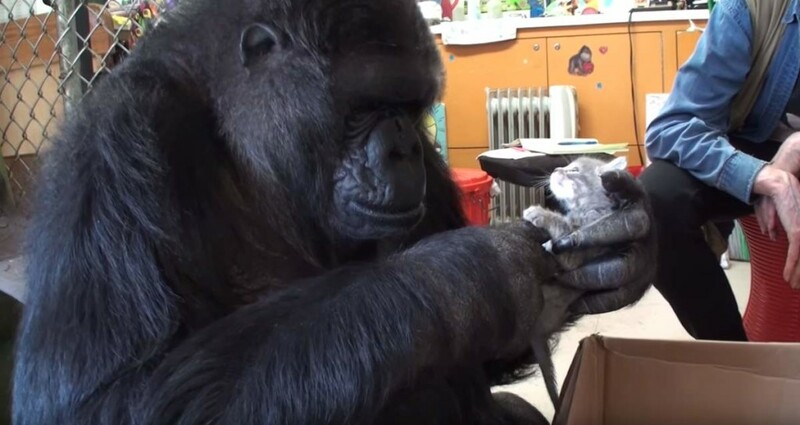 To celebrate her 44th birthday on last July, Koko the Gorilla was presented another litter of kittens. Picking two she named them Miss Black and Miss Grey. She do like cats, and is one of the few non-humans known to keep a pet.